Look - it's a big fish. I'm a theme guy. If you've been to my blog before, you know this. I love all games, and I am not opposed to abstract games; but as far as I am concerned, a dollop of theme makes anything more palatable. The theme doesn't even have to be totally integrated for it to work for me. Hive, Lost Cities, Dragonheart, Biblios... Not exactly the most thematic gaming experiences, but superb games with just enough theme for me to feel more engaged than I am playing something like Pentago. But the games I love the most are those where the theme is ladled on thick. Space Hulk, Gears of War, Fury of Dracula, Super Dungeon Explore, Claustrophobia, Winter Tales, Tash-Kalar (yes, Tash-Kalar), and Mage Knight... These are the games that capture my imagination, and transport me into another world. 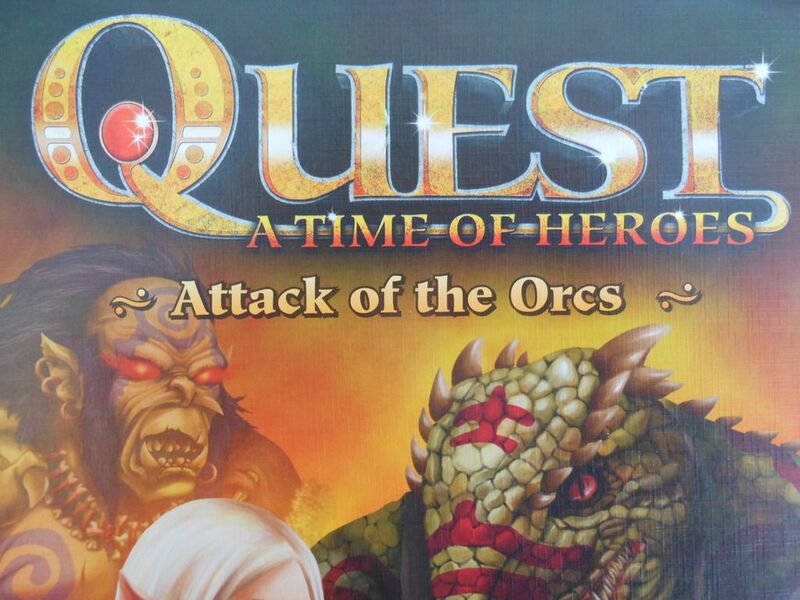 Considering my predilection for such games, Quest: A Time of Heroes - Attack of the Orcs (hereafter called Quest, to ease the onset of RSI) seemed like an obvious fit, and I jumped at the chance to pick up a copy when I found it on sale at Amazon for less than £10. Quest is one of those old-fashioned heavily thematic adventure games that pits a group of heroes against a dark overlord (or game master) in an epic quest. In most games of this sort, the heroes delve into a dungeon, kill some monsters, level up, find treasure, and buy some new equipment. They grow. They evolve. They come to life. Their story comes to life. 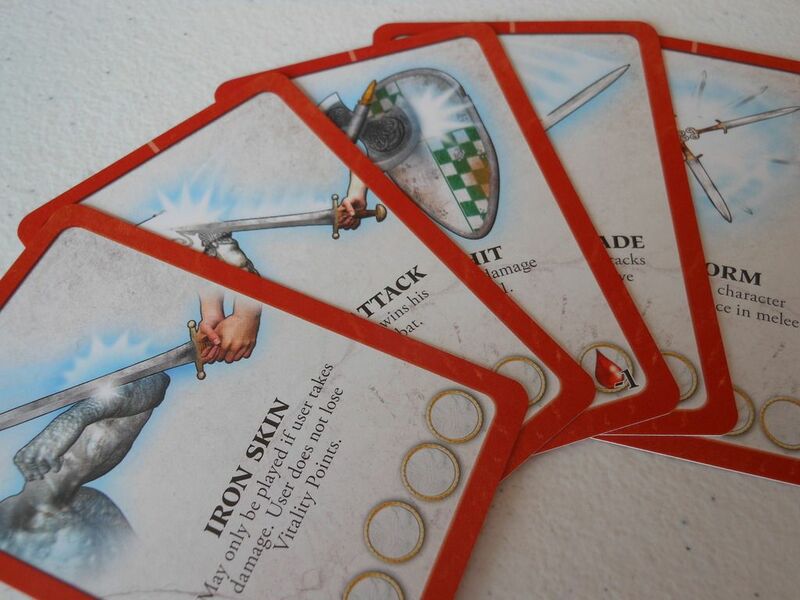 Each dice roll, each new treasure card, each slain monster, becomes a part of the story. You create your own legend. But in Quest, things work slightly differently. 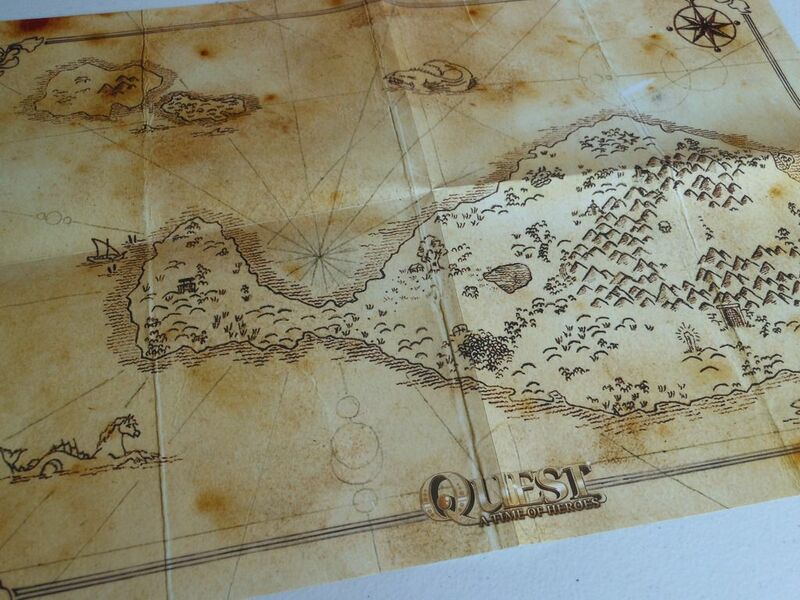 In Quest, the legend is already mapped out. The heroes walk a preordained path, dictated by a thick adventure book, which relates events and occasionally provides opportunities for the heroes to alter the course of events based on decisions, skill tests, and battles. Anybody who remembers the old Fighting Fantasy "Choose Your Own Adventure" books knows what to expect here. 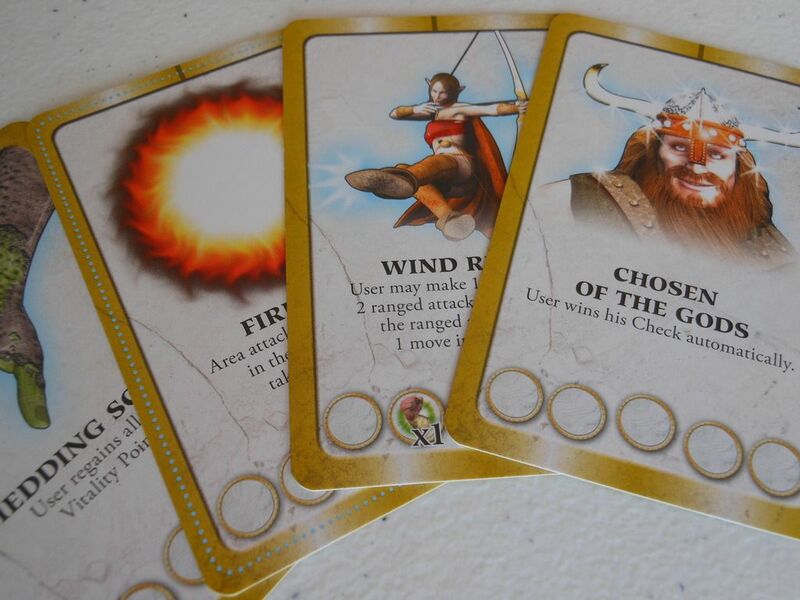 The game master reads a section of text, and at the end there is a decision to make, a skill test to perform, or a fight to win. The results of these events dictate the next passage of text for the game master to read, and so the story progresses. And it is a story. A proper story, with dramatic moments, exciting climaxes, and tough choices. This is a system that offers the potential for an immersive adventure, where it is a writer, and not random dice rolls and card draws, that crafts the nature of the encounters. The writer is a guiding force, sculpting the world, and making a fulfilling quest that has the potential to be more engrossing than anything other adventure games provide. In fact, there are lots of problems. You may have noticed my use of the word "potential." That wasn't an accident. Because Quest fails in its attempt to create an immersive storyline. In fact, I have never seen a game that strives so hard to be a thematic, storytelling experience while at the same time creating quite so many barriers to entry. A good thematic game draws you into the world. It hooks you at an emotional or intellectual level, and it won't let go. Quest pushes you away every chance it gets. By that, I mean, imagine something that would ruin your immersion in a book, television show, or movie. Imagine that one thing that snaps you back into reality. That continuity error in the film. That spelling mistake in the book. That bit of dodgy acting in the television show. Quest is an explosion of those "WTF?" moments. It's a car crash of mistakes. For a start, it has the most generic and boring fantasy theme possible. Of the four heroes, only the lizardman shaman is remotely interesting. The other options are a human mage, an elven ranger, or (of course) a dwarf warrior. Generic elf, ready for action. These utterly bland heroes explore a world where they discover equipment such as swords, shields, crossbows, and the mighty potion of healing. And every now and again they get caught up in a scuffle with thrilling adversaries such as orcs, slightly bigger orcs, really big orcs, and orcs that know magic. An exciting array of heroes and villains. I could forgive a generic fantasy theme if the game offered a good storyline, but it doesn't. It's just some twaddle about an evil force lurking behind a gate that wants to break out (probably intending to rule the world from an evil lair beneath an evil volcano). Worse yet, the translation of the text in the adventure book is appalling. There are spelling mistakes, changes in tense, and poorly constructed sentences. And that's just in the first paragraph. Considering reading from the adventure book is such a big part of the game, the publisher really should have spent more time getting this right. It isn't that the game uses cardboard standees instead of miniatures. I actually don't mind that. It isn't that the cards lack a linen finish. It isn't that the game is in such a small box that you can't fit the components back in once you pop them out of the punchboards. I honestly don't know what the designers were going for here. A few of the location cards have nice painted artwork, but these just look jarring compared to the special ability cards, which were thrown together using what looks like clipart. Seriously? Someone got paid for this artwork? There is no sense of cohesiveness between the different cards, and most of them look so bad you can't help laughing. Let's wrap this up quick. The game is a mess. I wish I could be more positive, but I can't. The game master reads to the heroes. The heroes make a few decisions. They may have to complete a skill check which involves rolling a dice. This goes on for a while until a fight breaks out. And then the game grinds to a halt. 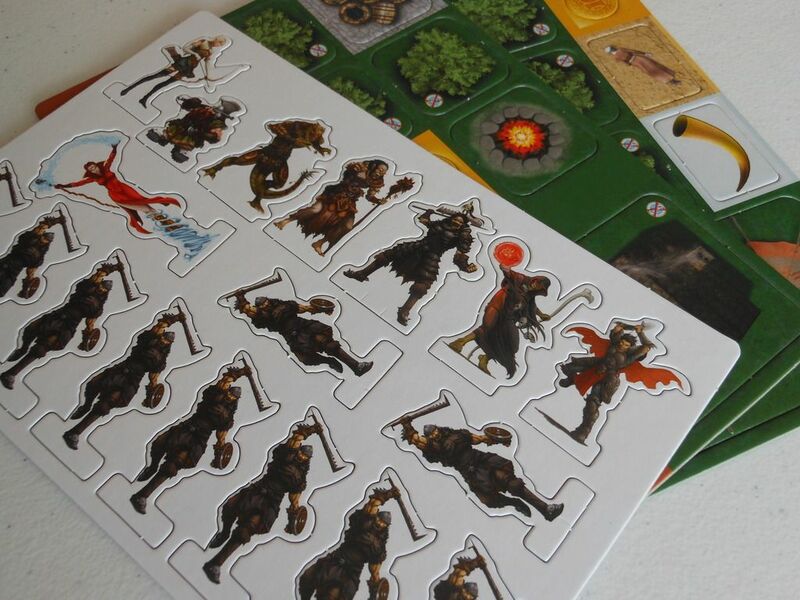 The heroes wait while the game master uses some special cards to lay out the perimeter for a battle ground, and then assembles the standees for the monsters, and then finds the tokens that represent trees and other landmarks. 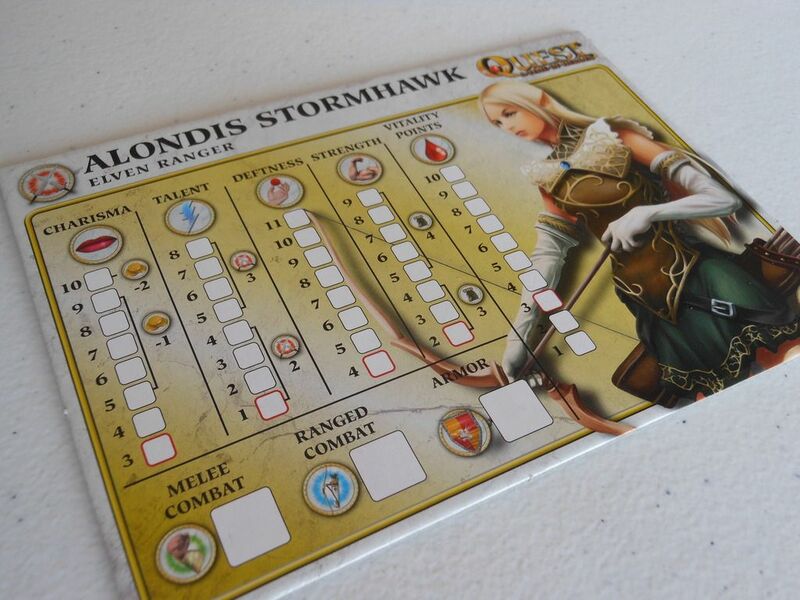 At this stage, the game transforms into a budget skirmish miniatures game. Unfortunately, because fighting is not the main focus of the game (there is only a single battle in the first quest), not a lot of effort was put into making the combat system engaging. It's very simple, with mechanisms that seem designed to "get the job done" quickly and easily with the least amount of fuss possible. In the end, players simply measure distances, move standees around, and roll dice to hit each other. It's incredibly pedestrian, and lacks a lot of the tactical choices and intricate positional play that skirmish games normally offer. I mean, seriously... This art? For real? Ultimately, Quest attempted to do something new and inventive. It attempted to combine a storytelling roleplaying game with a miniatures game, and in doing so failed to do either one particularly well. You get very basic roleplaying, clunky storytelling, boring fights, and mediocre components. No single element of the game is strong enough to stand on its own merits, and when these elements combine the whole is even less than the sum of its parts. It was a brave experiment. And much like its badly translated adventure book, the game itself ended up being bland, and full of mistakes. So many times I've been tempted to purchase it... now I now why it was so cheap. Thank you and your hilarious reviews! Thank you for taking the time to read and comment. I appreciate it. I have seen this game in several local discount stores and it seems to be getting cheaper and cheaper. I think the game radiates blandness just from the box. And all the best artwork is on the cover! You just saved me a purchase. Thanks! Glad to be of service... Sort of. Agree with everything you've said - however I do have a positive to add in the games favour. Was disappointed in this myself, but it's proven to be a great gateway rpg game for my 9 year old. Maybe that's the ideal target market? Glad you enjoyed the game. However, now that FFG has released Dragonholt, I should imagine most people looking for that introductory-RPG / story-based adventure game vibe will gravitate to that game instead (although it does amuse me that FFG advertised Dragonholt as "revolutionary" when games like Quest were on the market years before).